Monsters in the Art Room! 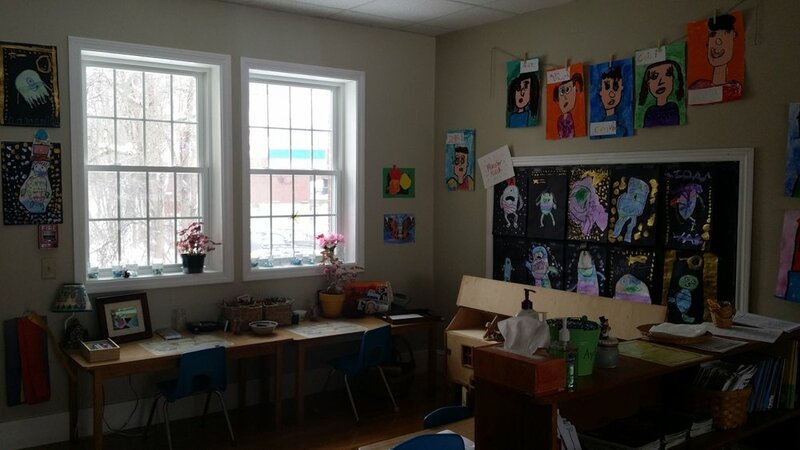 This morning while I was setting up for the open house, the classroom was quiet, aside from the Celtic Harp playing off Pandora, and soft, February light was fluttering in the windows over the art table. The space was peaceful and exactly what I envisioned it to be the first time I saw those beautiful windows on the back wall during the renovation. The 'art table' as we refer to it in the classroom is open for exploration all the time. Children use the table for all sorts of projects throughout the day. Sometimes there is a project and materials left our there by me, other times it is entirely the children's free and creative time. This past week we started something new in the space. Our classroom assistant Sharleigh, began having 'art time' with the children. She met with the children in pairs and helped them create these amazing monsters! Didn't they do a fantastic job? Life tends to come full circle doesn't it? Sharleigh was one of my students during my first years of teaching in public school. She is imensly creative herself. She used to draw lots of pictures of horses when she was in second grade and she has become a talented actress, now in her senior year of high school, and looking forward to a college degree in Musical Theater. Each monster has entirely its own personality! I love them all. Teacher Netta's Notes - Snowballs!